Are you beyond the basics? 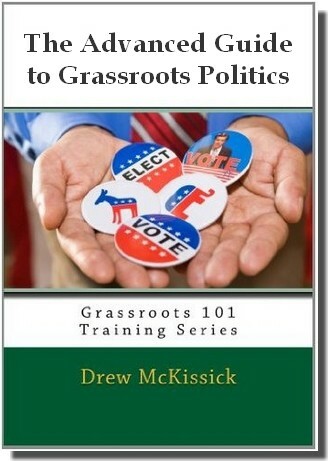 Ready to learn more about successful grassroots politics? Then it’s time for you to move up to The Advanced Guide to Grassroots Politics. It’s Level 3 in the Grassroots 101 Training Series. and it can help you take your political activity (and impact) to the next level. If you’re ready to find out more about the things you need to know to be even more effective at the grassroots level, this is the guide for you. When it comes to making a difference, it’s one thing to have the will, but you also need the “know how”. Get the information you need to have a greater impact! Order now via Amazon.com for just $19.95! How do you do effective research? How do you build a lobbying coalition? What are the keys to lobbying success? How do you target votes? What is “grasstops” lobbying? And how do you go about it? How do you prepare information that’s more likely to sway an elected official? How do you organize a campaign? Who should do what? What are the three key elements of any campaign? How do you fundraise for campaigns & elections? How do you communicate your message? Some suggested tips and tactics. Whats the best way to work with the press? What are the basic rules of parliamentary procedure? How do you effectively manage volunteers? …and much, much more! Order your copy now! So what are you waiting for? Make an investment in being a more effective advocate for the things you care about. Not ready for the “Advanced Guide”? Then check out the “Beginner’s Guide” or the “Intermediate Guide” to get the information you need to have an impact!